Do we need a multistorey car park? Do we want one? Are there alternatives? Please vote below. This is not the first call for a multistorey car park for Ludlow. 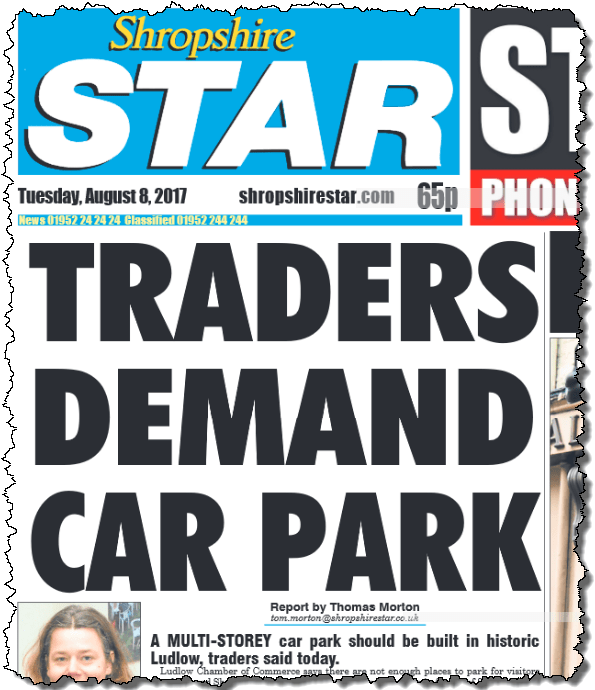 The idea has been mooted a few times over the years along with demands that off-street car parks to be handed over to Ludlow Town Council. With Shropshire Council reviewing how much it squeezes out of the public for car parking, it is timely to look at the idea again. The only practical place for a multistorey is on the car park behind the Library, Upper Galdeford B. A multistorey at this location would take advantage of the contours of the land. If it was one-storey high – two parking decks – an extra 220 spaces could be created. That would increase the capacity of the Upper Galdeford car park from 329 spaces to an estimated 551 spaces. Overall, off-road parking in the town would increase from 581 spaces to around 800 spaces, an increase of nearly 40%. Adding a third deck could provide another 240 spaces. We have constant complaints about the lack of car parking in the town centre. Not just from visitors but also those doing their daily shopping at our independent shops and supermarkets. It is very hard to make a car park beautiful. Multistorey car parks are notoriously ugly and unloved. This does not have to be the case in Ludlow. Should this idea come to fruition, we should aim to swaddle the building in flowers and greenery. It should be our very own “Hanging Gardens of Ludlow”. Any scheme should improve the Upper Galdeford and Station Drive area, not detract from it. I would not support an ugly building, no matter what the economic benefits would be for the town. How would a multistorey be funded? I can’t see Ludlow Town Council being brave enough to take on a scheme as large as this. If any action is to be taken, it will by Shropshire Council. Most major councils, including Shropshire, tend to be capital rich and revenue poor. The council leader, Peter Nutting has advocated investing in infrastructure cross Shropshire to generate long term revenue. So, if there is a will, I think a business case for a multistorey could be made to Shropshire Council. But there could be significant disadvantages to this scheme. A two-deck car park will generate perhaps an extra 500-600 vehicle movements a day. That will increase traffic pressure on the Galdeford corner and the One Stop junction in East Hamlet, as well as along Gravel Hill. A multistorey car park will promote car traffic and, until we go all electric, generate more toxic air. Shouldn’t we be promoting more sustainable and environmentally friendly alternatives? Would it not be better to invest in better park and ride facilities and services? Let me know your views in the comments area below. But first, please cast your vote on whether you think a multistorey car park in Ludlow is a good idea or simply not right for this town.
. To the best of my knowledge, Ludlow Town Council has not made a request to Shropshire Council for transfer of the car parks.
. This is a back of an envelope calculation. Around 360 new spaces would be created on a two-deck car park. Approximately 138 existing spaces would be lost.
. Excludes the Linney car park, which can take up to 40 well parked cars.
. Green walls are now commonplace in cities and towns around the world. I am not in favour. This would be another step towards making Ludlow just like any other town. I am not in favour. This would be another to make Ludlow just like any other town. No. Gravel Hill is not easy to drive along now. There’s congestion created by parked cars. Better park and ride facilities would help, as would finding a way to make it unnecessary for coaches to squeeze their way along High Street. This topic has been raised and discussed before when the original parking scheme was devised. Perhaps reachers should delve in the archives and find the plan that was created by Mr Havard, which was widely accepted as a good plan. I also remember reading somewhere that some money had been ring fenced but unfortunately cannot remember where. Is the park and ride full everyday? no multi story carpark should be considered until that is the case. Couldn’t edit so adding a reply. In reference to Mr Havards plans have just seen in the minutes of the IN and Out of Ludlow Forum meeting 11/06/2015 that Cllr Perks inherited the deceased papers regarding Ludlow Transport Hub. No – this seems counter productive in my opinion as parking can be found in Ludlow. The town is famous for attracting visitors because of its heritage – it needs to stay that way! Multi-storey car parks are for larger towns that need to utilise space. No, we shouldn’t have one – they are very ugly buildings and will make Ludlow look less attractive. I had to use a few multi-storey car parks over the last few days during my holiday down south – they smelled of urine and several homeless people were living in them. I just don’t think one will be advantageous to Ludlow. I agree with the comment about using the Park and Ride more – maybe more frequent buses would encourage people to use it more. I do not agree with the notion of a multi-storey at the One Stop junction. The view across to Whitcliffe is incredible from the car park, and not only would it destroy that outlook but also destroy resident’s view of St Laurence’s. It might be an idea to put any multistory, on the Lower Galdeford car park (leaving some coach parking) and ship people up in buses. That way, because it is lower down, you could go much higher than 2 floors. When the library was built an opportunity was missed to have a multi-storey car park underneath the building and that’s when a lot of spaces were lost. I wouldn’t support one at top of Galdeford as traffic already far too busy along there. A multi-storey car park could all be below ground. Above the car park, that is the existing tarmac area there could be housing providing homes for young people living in the town, with gardens and trees. Multi-storey car parks do not have to blight the skyline! It could provide not only car parking but coach parking also, thus stopping large coaches from coming into the town centre. I know that the proposal for underground car parking was looked at several years ago. The principle was accepted but the cost prohibited further action. 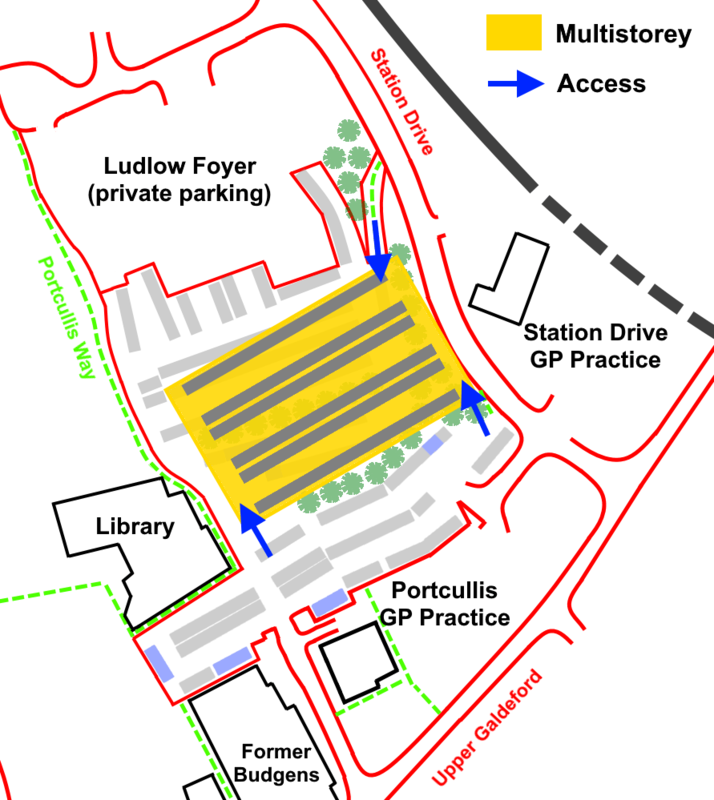 I think a multi-storey car park off Station Drive and Gravel Hill would not be the answer but that better signage on ALL roads coming into Liudlow would make the park and ride a more practical prospect. This proposal was put forward by the Ludlow Chamber of Commerce, so businesses not residents. Multi story or not to look towards the future you should develop electric filling points at existing carparks. Ludlow is a nightmare place to park on weekends, can we not utilise the land on the old Castle garage petrol station? I think it would be eminently sensible to add a further level to the lower part of the Galdeford car park. It would not be an eyesore at just one level and could be covered on the outside with greenery. I write this as one who arrives early in the morning in Ludlow and therefore has no difficulty in obtaining a parking place but I do feel for locals and tourists alike who wish to park fairly near to the town centre. The vote seems to have disappeared, I can’t see any link, buttons etc? But my vote would be YES, we certainly need more parking in Ludlow and a multi storey either at Galdeford lower levels or underground at Smithfield would, in my opinion, be a good idea. Park and Ride is all very well if you’re able to use it and the times suit, but if you have lots of shopping/just want a pop and shop, are disabled, have a pram or need to be in town for a specific period (to name but a few) then it’s no good. Also there’s limited parking space at the Park and Ride, I have been there when that’s been full. Sorry the vote wasn’t visble. It should be at the bottom of the post just above these comments. Yes agree Galdeford lower car park could be modified as not a historic part of the town with the library and Tescos in close proximity. You can’t make visitors use Park & Ride as they like to park near to town’s attractions as figures indicate. NO. We do not need a multi-storey carpark in Ludlow. Gravel hill is horrendous now and I have not seen anywhere in your replies about the schoolchildren that have to use the Very busy roads and gravel hill to go to school.A disaster waiting to happen. Why not put on more park and ride facilities and bus them in. Ludlow is not the right town . We need buses. I travel to Ludlow 3times a week with someone else who is going anyway but I would like to get a bus. There isn’t one travelling from Bridgnorth any more. Elderly friends unable to visit cinema, classes, meetings etc. (But at the same time we worry about loneliness.) If there was decent public transport in Shropshire that also worked at weekends and in the evenings there would be less traffic. Extra parking (including park and ride) is a short term ( and only partial) fix that doesn’t improve anyone’s quality of life.